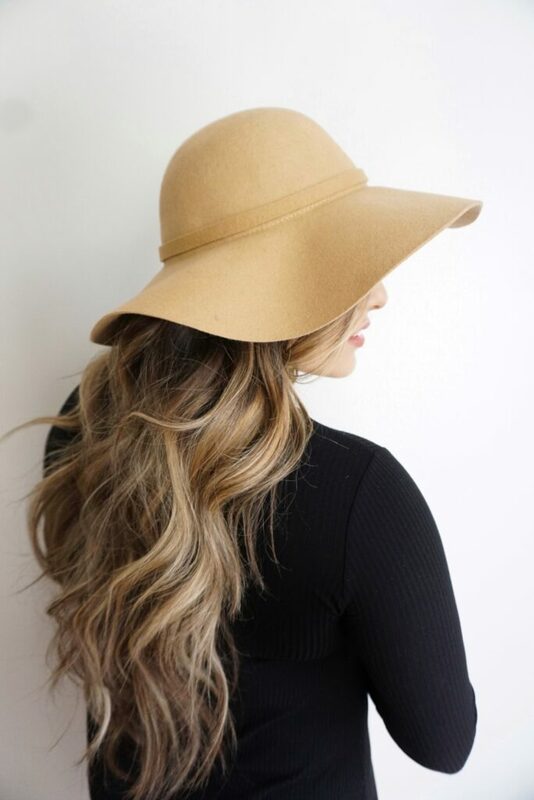 Hats can hide a multitude of hair sins, like not washing your hair for 3 or more days or just being plain lazy when you go to bed with wet hair because you didn’t feel like blowing it dry (guilty on both counts!). One of my favorite things to do in either of those situations is throw on a cute hat. 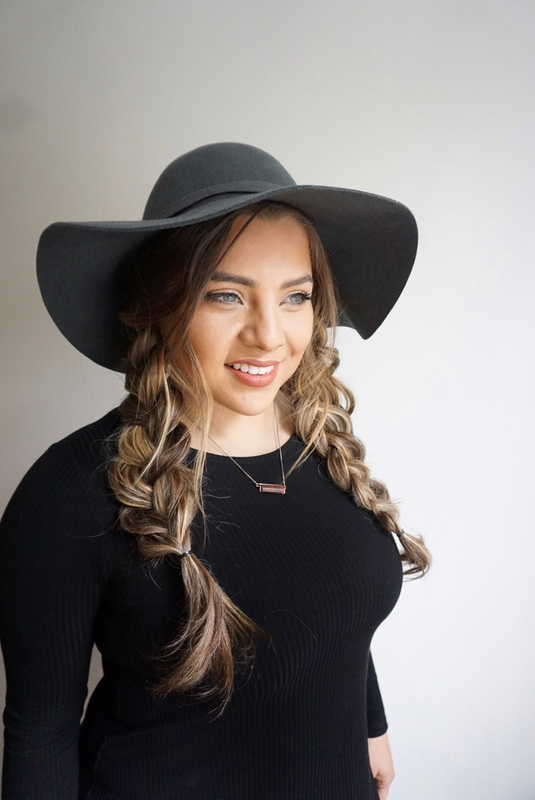 If you went to bed with wet hair, chances are you have some funky kinks and wild strays that need to be tamed in the morning, so before you put on your hat you can quickly wrap large sections of your hair around a 1 inch curling iron or wand to achieve beach waves like I did for my model, Jazz. Can we just take a moment to raise the roof for her amazing hair?! Below is an idea if you want to have beach waves but also add a fun element, like a fishtail braid. This style is also great if you prefer to have all of your hair down as your security blanket, but want to incorporate fun details. Instead of a fishtail you could always add a few tiny 3 strand braids and pull them apart to get that messy braided look. Either way, make sure to use tiny rubber bands, rather than thick ponytail holders, to close off the end of your braid so it’s not noticeable. 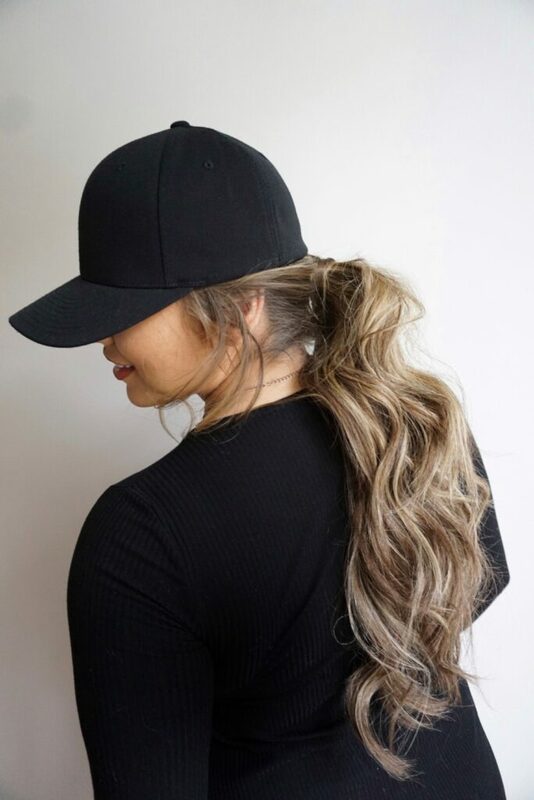 Since it’s “get into shape and go to the gym” season, I couldn’t help but post a pretty ponytail with a ball cap. Baseball season is just around the corner too and this is a great look to wear with your favorite team’s hat to a game. To make this look a bit more feminine, pull a few stray pieces out around your face before putting on your hat. I’d also recommend wrapping a small section of hair around your ponytail holder and securing it with a bobby pin to cover up your hair tie. 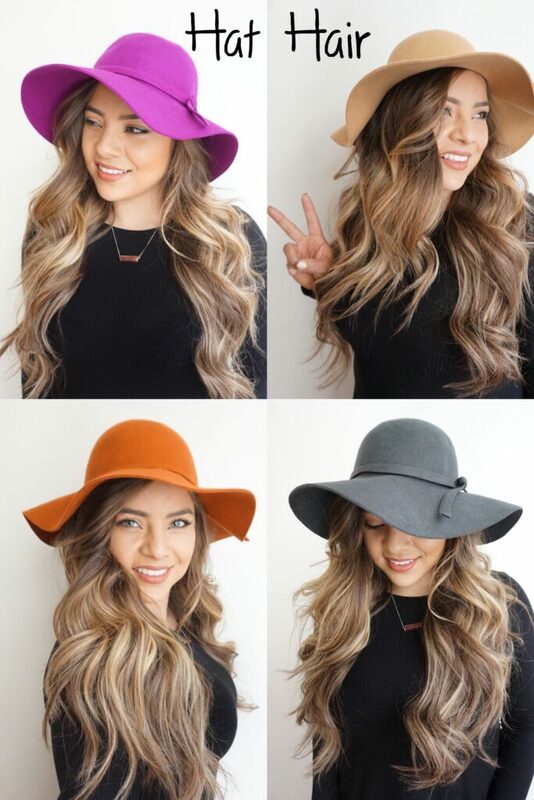 The wonderful thing about wearing hats is all the options! 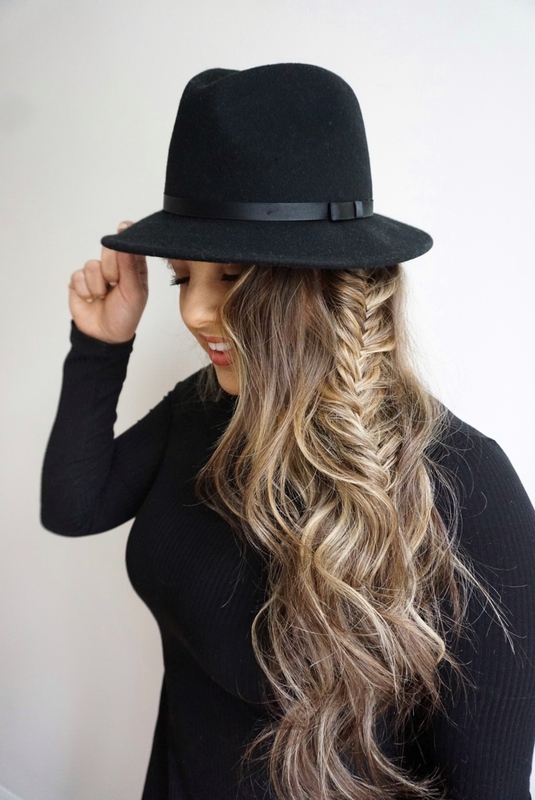 When you’re in a hurry, or you’re just starting to experiment with different hair techniques, you can never go wrong with a basic 3 strand braid. They’re girly, flirty, and you can make them as smooth or messy as you want. 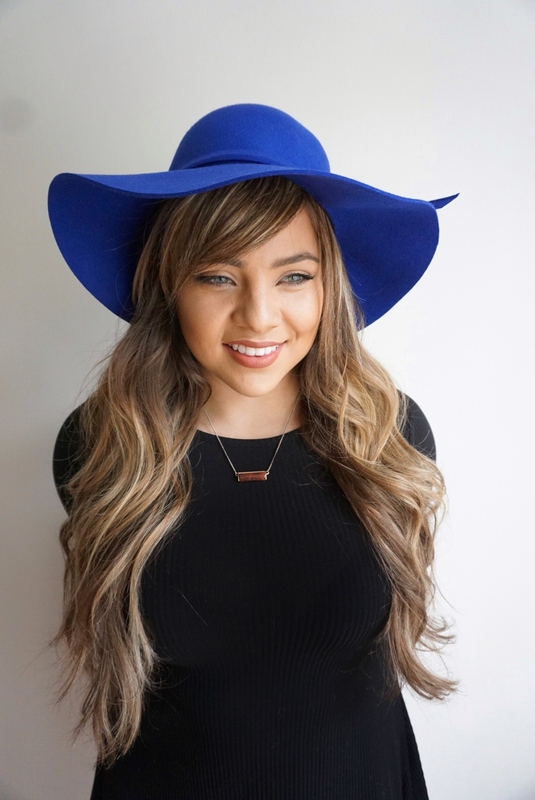 Truly one of the cutest hat hairstyles! 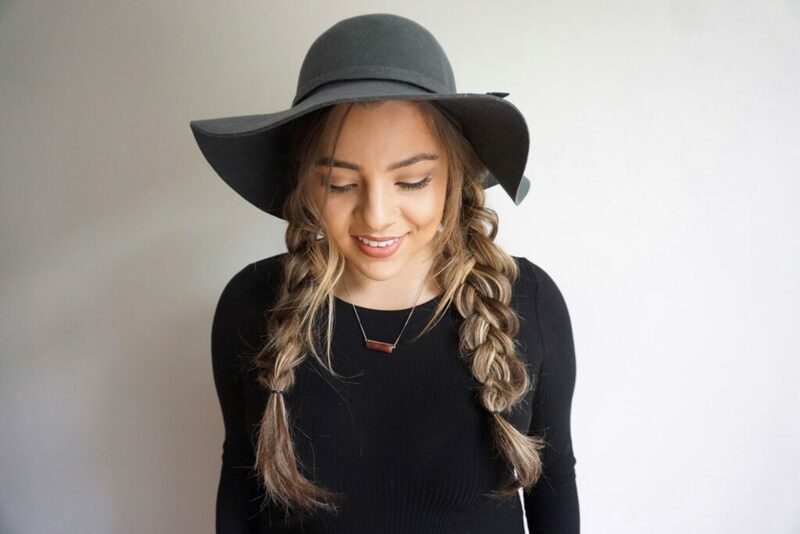 If you don’t like the look of two braids, you can always pull all of your hair to one side and create one fuller braid to drape over your shoulder. Again, just make sure you use an inconspicuous hair tie to close off the end. If you don’t have a hair tie that matches your hair, another idea is to use one that matches your shirt! Haven’t you always wondered what you’d look like with bangs, but are too afraid to make the chop? As you can see in the photo below on the left, Jazz doesn’t have bangs. Don’t worry, I didn’t convince her to let me chop hers… Or did I? 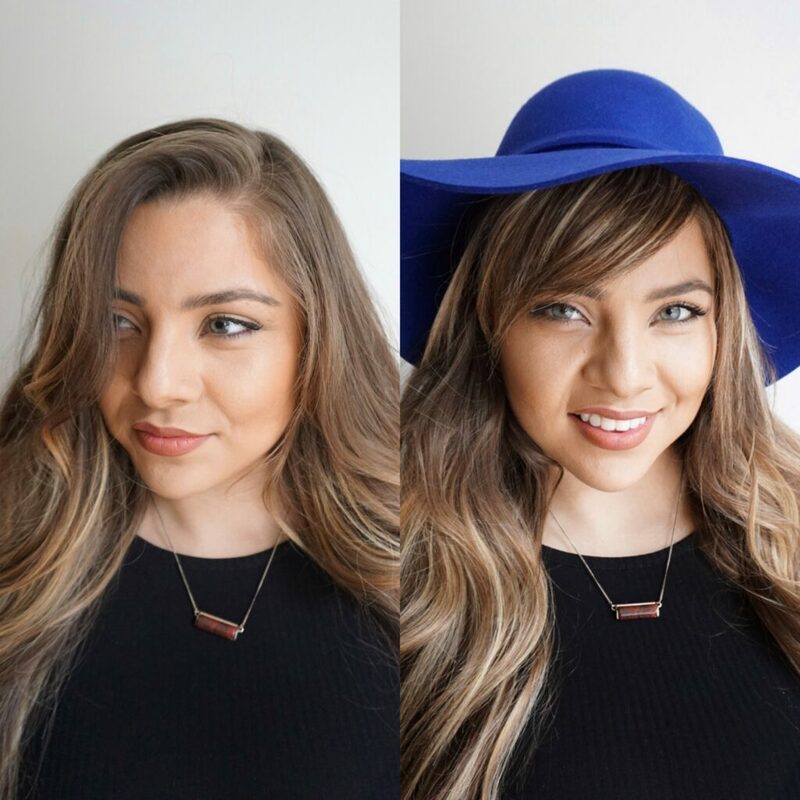 You can find some clip on bangs (yes those are a real thing!) at big box beauty stores or online, or you can do what I did on Jazz and use the top layer of hair to pin and drape across your forehead. Yes, this takes some skill and creativity. However, don’t worry about making a mess because you’re going to put a hat over all the craziness on top of your head! Remember those hair sins I was talking about earlier? If you only knew what was under this blue hat! What a great way to trick your friends for fun. Just don’t try this on a windy day or when you’re riding in a convertible car! In my world, it’s ALWAYS hat season. Smaller felt floppy hats like the ones I used are great for any season paired with a scarf in the snow, or a bikini at the beach. Hope you have fun trying out these styles! For more great hair ideas check out Hair and Makeup Girl.